The Runtime settings can be configured using the dropdown gear menu in the top toolbar. Manage Users menu gives access to ntopng users administration. Ntopng is a multi-user system that handles multiple simultaneous active sessions. Ntopng users can have the role of Administrators or standard users. Password and other preferences such as role and allowed networks can be changed by clicking on button Manage, which causes a new window to pop out. 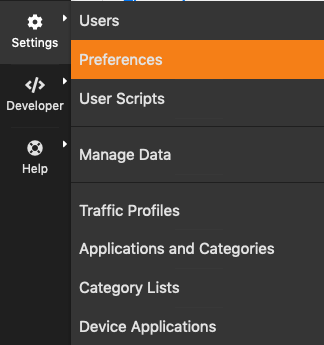 Preferences menu entry enables the user to change runtime configurations. A thorough help is reported below every preference directly into ntopng web GUI. Ntopng is able to export monitored hosts information. It allows to export data in JSON format giving the user the ability to include ntopng information in a user created GUI. Please note that on Windows systems the runtime configuration file only is provided. ntopng configuration can be restored by placing the compressed tarball (downloaded via Backup Configuration) into the ntopng data directory and restarting the service. The tarball must be named conf.tar.gz. For example, assuming the default /var/lib/ntopng data directory has not been changed, one can restore a previously backed-up configuration by placing the compressed tarball in /var/lib/ntopng/conf.tar.gz and then issuing a systemctl restart ntopng. After the restore, the compressed archive into the data directory is automatically deleted. Restore is only supported for packaged ntopng installations on systems that use systemd. Geeks and those who are building ntopng from source should have a look at script httpdocs/misc/ntopng-utils-manage-config.